You'd expect to find the satirist of brides-to-be, girls on their first job, movies, office types, average people anywhere jarring elbows with the subway crowd and rushing around New York City with an eye on his neighbors. Instead E&P took a day's expedition into the wilds of Connecticut and found W. E. Hill in a lovely old house surrounded by dogs and playbills. And detective stories. "PeopIe are the same in Danbury as In New York," explained the cartoonist. For more than 26 years now, Hill has been drawing his satirical pen sketches for the Chicago Tribune-New York News Syndicate. In a Sunday world of color pages he has turned out the only syndicated black and white page successful over a long period of years. "I'd love to do color," Hill exclaimed as he blocked out the frames for his week's page and started sketching a boss and secretary scene in the second panel. for a while, talking freely about books, plays, people - anything but himself. "There's no story in me," he said, and meant it. "An interviewer once came out here to get a story and was having a terrible time. When she heard I like dogs she brightened up. I was sorry to disillusion her, but all my dogs are mutts I've picked up somewhere." "You know this isn't the way I usually work," he noted after he had gotten the boss and secretary lined up to his satisfaction. Usually I plan a page pretty thoroughly in advance and do as many other things as possible first while theoretically planning that page, such as reading detective stories, he added, proving he could satirize himself, too. Eventually he gets down to work at night and frequently works most of it. Ideas? Well, he's stored up a good deal of background during a life that began in Binghampton, N. Y., and included quite a few years in New York City before he settled down in his family's Connecticut home, but his fresh situations may come from anywhere, his observation of movie styles, suggestions by friends, or attendance at a town meeting. "I notice people are wary of me. Even a cousin of mine has been taking a good deal of ribbing since they learned she was my cousin. But I always mix 'em up so nobody can be recognized." And with a cheerful grin he admitted that nobody could ever recognize himself or herself in one of the drawings - though occasionally persons believed they identified an aunt, sister or mother-in-law. He chose art as a career, however, instead of following his family's business "probably because I was so bad at mathematics," studied at the Art Students League In New York and during the years he lived in the city frequently visited the classes for refresher work in the belief that he can always learn more about his profession. 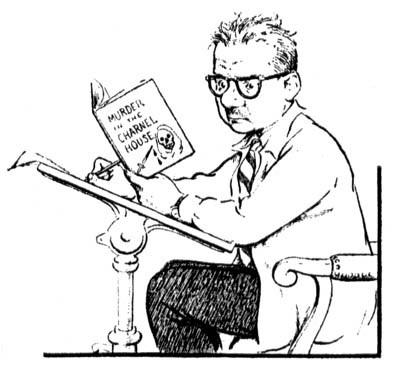 For a time he freelanced and appeared frequently in the old Life, then he drew personality and situation cartoons in much the same satiric vein as now for the New York Tribune. Then in 1920, shortly after the New York Daily News was started, he became a fixture there. the attractive secretary. "Just when I think I've got them, they go ahead and change." A perfectionist, Hill looks through his horn-rims at his own products with critical eyes, and If it weren't for deadlines would probably never finish a page. "Loads of times I'll make mistakes and a page will come perfectly dreadful," he Insisted, "but If you're at deadline, you have to go ahead and do it." Here's a 1927 example of Hill's beautifully drawn Among Us Mortals. Usually the feature was run in magazine and roto sections, where the printing was occasionally of high enough quality to capture the incredible detail of Hill's work. This image at screen resolution is a desecration of Hill's artwork. Hill is one of the forgotten masters. Can someone tell me where this article was first printed? And does anyone know specifically where & when Hill's work was published? Article published in Editor & Publisher, 1949. 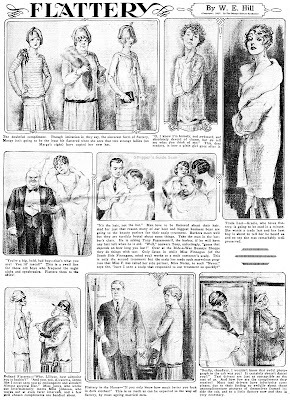 Hill's work was syndicated 1916-60 in many newspapers. I imagine many of you reading this blog are, just like me, eBay comic strip buyers. As you know, it has gotten to the point on eBay where it is downright foolhardy to give a seller a negative feedback, no matter how egregiously bad they are, because they will just turn around and fire back a retaliatory negative on you and there's not a darn thing you can do about it. In view of that problem I now leave negative feedback only in the most extreme cases -- those in which I send money and get nothing, not even junk, in return and can't get any answer at all from the seller after many attempts. Anything short of that and I deem it not worth the hit on my feedback to leave a negative. I do occasionally sell on eBay, and that makes it imperative that my rating stay high. So instead of posting negative feedback on bad comic strip sellers, I'm going to share a few of my experiences here that may save you from dealing with some highly questionable comic strip sellers. If you also have stories to share, I encourage you to do so. Maybe we can form a little informal feedback system right here and save our fellow collectors from those few bad eggs that can make eBaying a real pain. Seller #1: your-ebay-store : this seller, apparently representing one of those stores where people can drop off merchandise to be auctioned, is currently selling a bunch of newspaper strips. I purchased a 1940 Mortimer and Charlie page from him, a date later than anything I own. What I received instead was a 1939 page, and it was torn in half at the fold and had a large rat chew in the side. I told the seller of the problem and he immediately got snarky with me, but said that if I sent the page back to him (at my expense) he'd send the right page. Though I was already smelling trouble I sent the page back. I used the same cardboard packing material he'd sent it in. I made sure to get delivery confirmation on it to avoid the "I never received it back" ploy. Well, that didn't set him back one bit. He claimed that the package came back ripped to shreds, and the page destroyed (more than it already was?). He then claimed that he had another buyer who had bought this page and that I should pay him (again!) for the page I had supposedly destroyed. Now I knew I was dealing with a real bad news seller, so I stopped communication, went to Paypal and filed a dispute. Paypal, usually a real slacker when it comes to disputes, wasted no time and I got a refund. So deal with this seller at your risk. Seller #2: historicnewspapers : these folks have been selling a ton of Sunday sections on eBay, some of it insanely rare stuff. The good news is that these people have always been extremely honest and courteous with me. The bad news is that they are the worst organized gang of nitwits I've ever met. I've bought a lot of extremely rare Sunday sections from these folks, and I don't think there's a single shipment that I've gotten from them that was right. Sometimes the mistakes have been simple sloppiness, like sending the wrong date of a paper, or messing up their cut-and-pasted listings and thereby claiming there are certain strips in a comic section that aren't there. And every time I alert them to the problems they have made good on the mistakes such that I had no complaint in the end, although it was really annoying to have to go through these problems over and over. The straw that broke the camel's back was when they lost a shipment of over $400 of extremely rare Sunday sections (frankly I would have paid far more for them, but there was little competition for the lots). Some of these sections were rare to the point that they could possibly be the last existing copies. I waited for the package to arrive for over a month (they tend to be extremely slow shippers, too) and when I finally inquired about the shipment they said it had been sent "sometime in the last few weeks". No shipping records, no tracking info, no delivery confirmation. They had sent this package, for which they charged me a $50 shipping fee, by USPS media mail, uninsured and with no tracking. The package was lost forever with no hope of finding it. And it didn't really seem to bother them. They gave me a full refund with no problems. And I was left with the sick feeling that I didn't give a damn about the $400 -- I wanted those rare sections! It was at this point that I stopped purchasing from them. It was like a junkie laying off heroin, but I couldn't stand the thought of losing another unique comic section, priceless to me, because these people just didn't seem to give a hoot about their business. I sometimes look at their listings and drool, but I just won't get sucked in again. Proceed at your own risk, but if you do buy from them, BEG them to put tracking on their packages! from bad eBay experiences! And while you're at it, share your huzzahs for the good guys that you encounter. After I shared a batch of Jim Ivey's photos, many from the late, lamented OrlandoCon convention, one of the original sponsors of the con emailed me and offered up some of his own memories of the good ol' days. Thanks Charlie! I first met Jim Ivey at the 1968 or 1969 Phil Seuling "New York Comic Art Convention". Jim had his cigar going, along with a two foot high stack of original art piled loosely on a few tables. Back in those days original comic strip and comic book art was quite a bargain. "Peanuts" dailies were around $ 50, "Krazy Kat" Sundays were $ 500- $ 750, and most comic book covers and pages were $ 10- $25 (including Ditko " Spiderman" pages !). I moved to Orlando in 1973 and became good friends with Jim, visiting his home or museum at least once a week. At the time Jim had some 3,000 originals and his goal was to have one original by every cartoonist in the world. Simply put, Jim never saw an original he didn't like! In early 1974 Richard Kravitz, a fellow collector attending college in Gainesville, and I drove to Miami for a comic convention put on by the legendary "Rocket's Blast Comic-Collector" publisher G.B. Love. The show was in a fire hall with no air conditioning, and it was literally 90 degrees in the shade. Tables consisted of wooden planks on cinder blocks. As we drove home, Rich and I both agreed we could certainly put on a somewhat better show. Rich suggested the Gainesville area, as the college students would certainly be interested in comics. I wanted to get Jim involved, and talked to him a few days later. He was all for putting on a convention.....but in Orlando. Jim was the regional Chairman of the National Cartoonists Society, and Orlando not only had plenty of cartoonists but also had Disneyworld as a major tourist destination. Rob Word and comic book and pulp collector Neil Austin joined us as co-sponsors, with Jim as the logical choice to be Chairman. Early on, Jim and I went to see Roy Crane about coming to the show as a guest. In a slow, deep Texas drawl he inquired "Just what the Hell is an OrlandoCon? ", as if it was some sort of "con" game. We laughed, and explained the concept to him. Subsequently invitations went out by mail, phone, or in person to some 40 of Florida's cartoonists. We decided to have a banquet for the cartoonists, and each year one artist would receive an "Ignatz Award"; a gold brick based on the love Ignatz had for Krazy Kat. The first convention book had a front cover sketch of Roscoe Sweeney by Roy Crane, and the back cover was a specially done original by Captain Marvel artist C.C. Beck. The show was held in September 1974 at a Howard Johnson's hotel (with air conditioning !). Dealers tables were $5, and for $1 admission you could have met Roy Crane, Hal Foster, C.C. Beck, Bill Crooks, Leslie Turner, pulp artist Harold McCauley, Ralph Dunagin, Mel Graff, and many others along with a film show provided by Rob Word. We also had a charity auction to benefit the Milt Gross Fund of the NCS to help cartoonists with financial problems. Hal Foster put in four "Prince Valiant" 1960's original Sunday pages. The prices ranged from a high of $240 to a low of $170! I moved to Pennsylvania later that year, but stayed involved with "OrlandoCon" through 1977. Those were amazing times in terms of collector interest, and I continue to give Jim Ivey a "Tip of the Hatlo Hat" for everything he's done over the years. A true "gentleman", and a great guy! Lately, I've been buying comics-related items on eBay, so thanks for the warning. I'll keep them in mind. I was 15 in 1974, and the Gainesville Comicon was the first one I ever attended (Wow! thousands and thousands of comics in one place!? Fantastic! -- this was back before there was a comic shop on every corner. You got stuff at a news stand or a 7-11 and that was it). The memory that stuck most in my head (over and above the great deals I got with my meager earnings), was myself and a couple HS friends meeting CC Beck. I had no experience at that time with Captain Marvel, but my friend knew the characters well. CC was doing little drawings for free, and, as he drew two arches, my friend guessed immediately what character CC was drawing for him (for reference, it was Mr. Mind. Does Ebay take complaints against sellers seriously? Better Buyers Unite.info is the only website dedicated to auction buyers. Would you mind posting your experience on BetterBuyersUnite.info? People really need to hear about your experience. I am trying to document attendance of key comics creators at Conventions for their Wikipedia entries and was hoping you could tell me which years C.C. Beck attended (I think he certainly came almost every year from the 1st in 1974 through 1979). Also when did Floyd Gottfredson attend? I know a lot of important creators who didn't generally attend conventions, like Hal Foster and Roy Crane, attended the Orlando show. Is there somewhere that I can get information on who the significant attendees were and which years they were guests? How many years did you folks put on the show? I remember from years ago the ads you ran for it in the old TBG and always impressed at the roster of guests. With the advent of wide-scale radio broadcasting in the 1920s and the popularity of building home receivers, newspapers began to cover radio topics with the same fervor that was once reserved for automobiles. Most major papers inaugurated weekly radio pages with all the latest dope on the subject. And of course, where there's newspaper interest in a topic, comics are soon to follow. 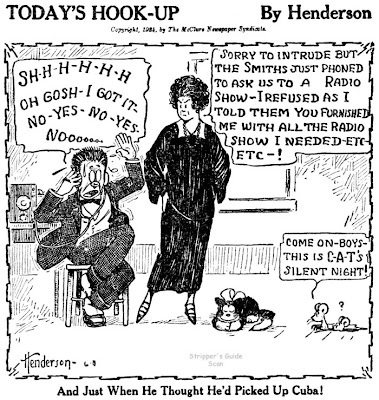 Today's Hook-Up by J.C. Henderson (who usually signed himself 'Hen' but not on this feature) was an early entrant, starting on May 19 1924. 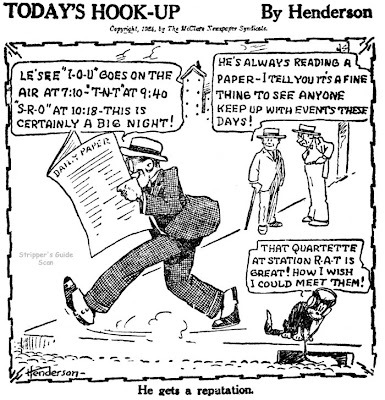 It was an excellent feature with good art, and gags that showed Henderson to be a knowledgeable radio enthusiast. The McClure Syndicate's only mistake was in marketing the panel as a daily, whereas most newspapers at the time were running weekly radio pages. Many newspapers did in fact print the panel weekly, but they would have been paying for the daily panel and tossing out five each week, a luxury in which few papers would indulge. And the panel really needed the surrounding radio page to set its tone -- it would have been a little odd to have such a tightly focused feature run on a general daily comics page. So despite the appeal of the feature its frequency hurt its chances, and it wouldn't have lasted long anyway. The fad for building homebrew sets had waned by the later 1920s as the price and quality of store-bought sets came down and went up respectively. The radio quickly changed from a hobby item to just another appliance. 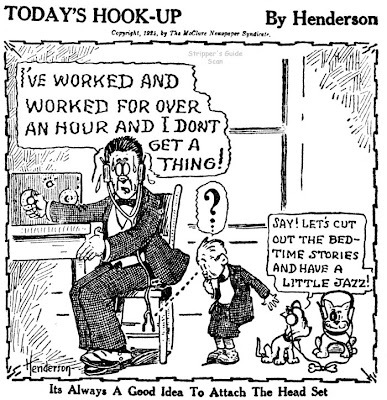 My longest run of Today's Hookup ends on February 7 1925. Glad you like the feature Lyn, I think it's pretty nifty too. I also liked your post -- great observation of the parallel with computer support. Considering I do software support as part of my job, feeling a bit sheepish that the connection was lost on me when I wrote my post! For some artists and some writers creating a successful comic strip is a lifetime ambition, but the Baers — Stanley and Betsy — broke most of the rules. Family teams are unusual but the Baers achieved a unique twist by not getting the comic bug until they had been 14 years married. Art or writing are the usual backgrounds for venturing into the field but Stanley went into comics from the wholesale grocery business and both Baers named as their chief preparation "raising a family." 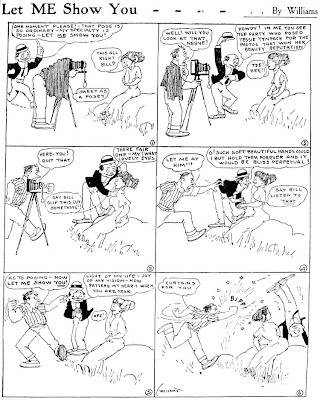 Finally, one successful comic strip is usually enough for anyone but the Baers had barely launched "The Toodles" in the brand new Chicago Sun before Mrs. Baer's father died and her mother asked the couple to take over production of the Bell Syndicate daily and Sunday comic "The Nebbs," and the Sunday strip, "Simp O'Dill." In New York this week to celebrate their 20th wedding anniversary, the "Chicago Baers" were commemorating also the fifth anniversary of their sudden arrival as wholesale comic producers. The Baers tried out the new field on a dare. 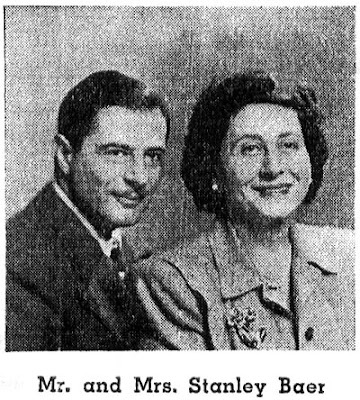 On a visit to Mrs. Baer's father, Sol Hess, they were discussing for the umpteenth time "The Nebbs," which Hess originated and wrote and which still carries his by-line. "If you know so much about comics, why don't you start one?' demanded Hess of the Baers. They demurred. ""You haven't got the guts," Hess charged. That dare was all we needed." Stanley Baer told E&P. The two set to work on a script. They decided that most comic strip parents were old-fashioned; so they would do a modern couple, and for children would capitalize on the universal appeal of twins. Next they ran a want ad for an artist and got 125 answers, tried out the 25 applicants whose letters sounded most promising — and were still without an artist until an ad agency friend told them of Rod Ruth who wanted to work on a comic. Sol Hess didn't think too highly of the strip's chances, but a month before his death the Baers were able to tell him the strip was starting shortly in the Chicago Sun and its syndicate. Then, at Mrs. Hess' request, they took over production of "The Nebbs." More recently they began to make some changes. Since the continuity of that comic had tended to deal more and more with oldsters, the younger Baers felt that the readership was growing older all the time. "We were wracking our brains how to get young characters in," Betsy Baer explained. "When Dad did the strip, he had had Betsy Nebb, the daughter, and Junior, the son, but he made the mistake of marrying Betsy off so she wasn't a Nebb. And he didn't grow his characters up though he was the one who suggested that Frank King grow Skeezix up. "So we contrived the cousin, Willie Nebb, who never took money from anyone, and his wife, who thinks Willie can do anything, and their children. It helped our Sundays bringing Willie in, and we made Junior grow so that we have all ages now." The two sets of comics are so different to the Baers that they have no trouble keeping the problems of each separate, but they no longer sit around looking at each other and trying to squeeze out an idea for the one they are working on. They sleep on it. Stanley is the idea man of the team and when a thought strikes him — perhaps while he goes about his wholesale grocery business — he heads for the nearest phone. Betsy writes the script, including suggestions to the artist, then Stanley reads it to himself. (They found Betsy's voice would color it if she read it aloud to him.) They check "The Nebbs" and "The Toodles" balloons again after Wally Carlson and Rod Ruth, respectively, have finished their art. Four obscurities for the price of one today as we take a look at the work of Orville P. Williams at the Boston Post. I really like Williams' art, so I've always been a bit leery of crediting the 'Post Williams' as Orville. His artwork, which had a wonderful panache to it everywhere else he worked was never up to the same quality at the Post. Yet it almost has to be him because the signatures are in his style. My best guess is that the Post worked Williams too hard and he sacrificed style for volume. And the Post did keep him jumping. 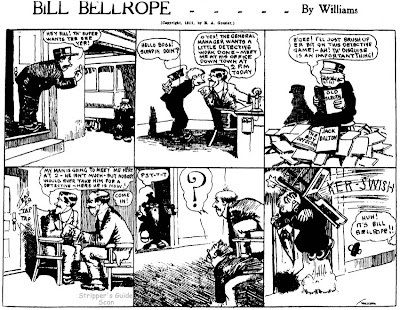 In 1910 when Williams got there it was very unusual for a newspaper cartoonist (other than editorial and sports guys) to be expected to crank out a strip every day, but that's exactly what Williams did for most of his tenure there. 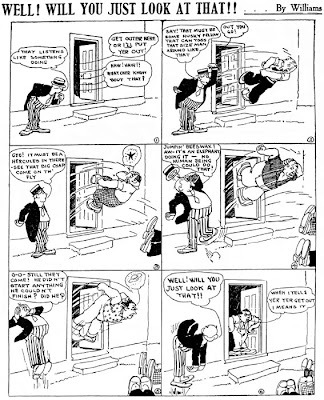 And whereas sports and editorial cartoons are normally a single panel, the daily cartoons that Williams produced were six or more panels, as can be seen above. For Williams, a guy used to doing one Sunday strip per week, this must have been a huge effort. When Williams started at the Post his first continuing feature was Let Me Show You, which ran for a handful of episodes from July 28 through August 6. On August 3rd and 5th he did a pair of episodes off Well! Will You Just Look At That! A week of inactivity then passed, and then Claribel started on August 18, running every second day, then on September 6 Bill Bellrope was added, and these two features ran on alternating days into 1912. 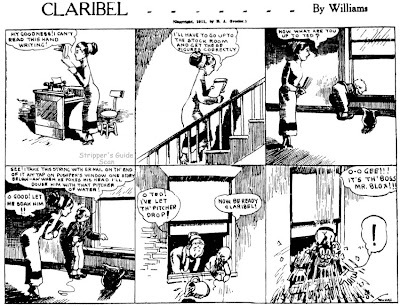 On June 8 1912 Bill Bellrope was dropped and Williams cut back to producing just Claribel on alternate days. I don't yet have an ending for the Williams story at the Post since I am awaiting further microfilm, but he was definitely soon to leave in mid-1912, as later that year he did a short-lived feature for NEA, then did another feature for the Philadelphia North American in 1913.